It's been two months now since my initial two ingredient meringue post on the What Fat Vegans Eat facebook page. In that time, I've probably gone through about 10 pounds of sugar, and eaten a good share of that making meringues out of aquafaba. Two things have come out of that: a sensitivity to the taste of raw garbanzo beans, and a dislike for the taste of cane sugar. This weekend was an exploration in other kinds of sweeteners for meringues, marshmallows, nougat, etc. It was back to the foundation for me, and that means starting with raw, whipped liquid from a can of beans and varying the sugar... the FLUFF. Lately, I have been doing some poort man's A/B testing to try to narrow down what qualities make Kraft products like Cool Whip or Marshmallow Creme taste the way they do. 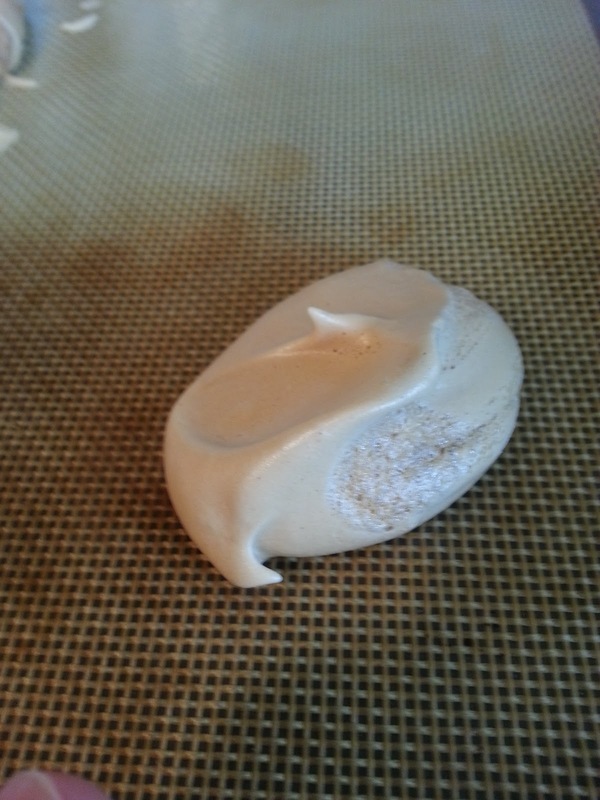 Those experiments continue, and I will share them with the development community at Vegan Meringues Hits and Misses! as they unfold. What I realized this weekend, however, was that I was still using my original recipe of aquafaba and cane sugar in all these trials. In the beginning of the vegan meringue craze I had toyed with artificial sweeteners like erythritol with some success, but the taste was awful, so I've been using cane sugar ever since, and occasionally corn syrup. I never really thought to use anything else except maybe honey, but that's a hotly debated topic in the vegan world, so in the interest of keeping things accessible to as many people as possible, it's not a consideration. Occasionally people in our vegan aquafaba development group join and ask if they can make meringues without sugar. I usually just respond out of habit now saying that stevia, xylitol, etc don't work, but erythritol works to some degree and they'd be better off just replacing some of the sugar. What I should have realized is that there are other dimensions to the sweeter that people care about. One such dimension is that of the glycemic index! Dextrose powder ... this is powdered glucose. It has an index value of 100. Way at the top! Maple syrup ... super accessible, purportedly healthier for you, and has a value of 54, which is lower than cane sugar. Sounds good. Coconut palm sugar ... 35! Brown rice syrup ... this has a value of 25. That's well on its way down to artificial sweetener land, so could be a promising low glycemic replacement. Agave ... this one surprised me. It's basically fructose, and comes in at 15. That's like super dooper low. Who knew? You have to boil your sugar first, preferably upwards of around 240°F/115°C. You want something else in there with the cane syrup, like corn syrup or glucose. It changes the flavor in a subtle way that make a real difference. You need your egg white replacer, in this case, aquafaba. You also need vanilla. Something about the combination of vanilla and boiled syrup is what really makes the marshmallowy fluff taste right. A vegetable gum like xanthan gum. Without a gum, you have the taste, but you don't have the right texture. Adding a small bit of xanthan gum or other gum makes all the difference. It gives it just a little bit of sliminess. Not enough to turn you away, but just enough to make it right. In my mind, it's the final magic that converts it from just another foam to marshmallowy fluff. For now, however, I want to see how far I can get towards those tastes with raw fluff, and by fluff I mean just basic aquafaba from a can and sweeteners. No heat, no gums, just two ingredients and lots of whipping. I shook the cane gently back and forth to loosen up the goop at the bottom, then opened it and strained it through a fine tea strainer to get 200mL of liquid. @5min - stiff, light peaks. 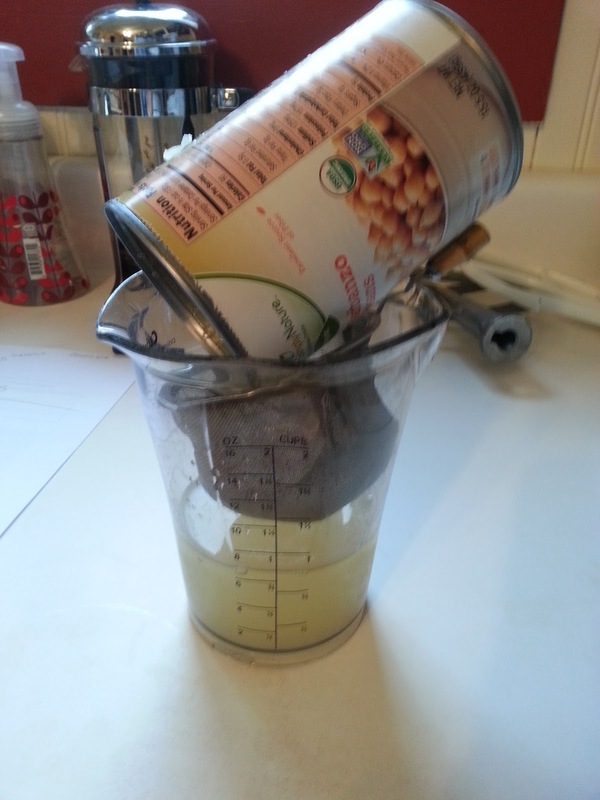 That made about 5 cups of volume... about 40mL of aquafaba per cup. I set that aside and split it into five parts. 1 Tbsp - sweeter already, light, fluffy, tastes a bit like maple syrup already, but still beany. 2 Tbsp - even sweeter, bean taste is partially masked. Still light and fluffy. 3 Tbsp - still able to make some small peaks, but not quite soft peaks. Tasting it made me think immediately of pancakes or waffles. The flavor is strong, like whipped maple syrup now. 4 Tbsp - too sweet. Put it into the freezer to test later as "A". All in all, maple syrup seems to be best suited for something like a pie topping, where you don't really care about peaks. It's accessible to everyone, it's better for you than sugar, but it won't hold its shape in meringues as any significant amount. Maybe if you limit to 1-2 Tbsp per 40mL of aquafaba you could get some meringues out of it if you don't care about appearance. And if you cool it in the fridge, you could probably whip it prior to serving. I bet it will make a great "nice cream," too! 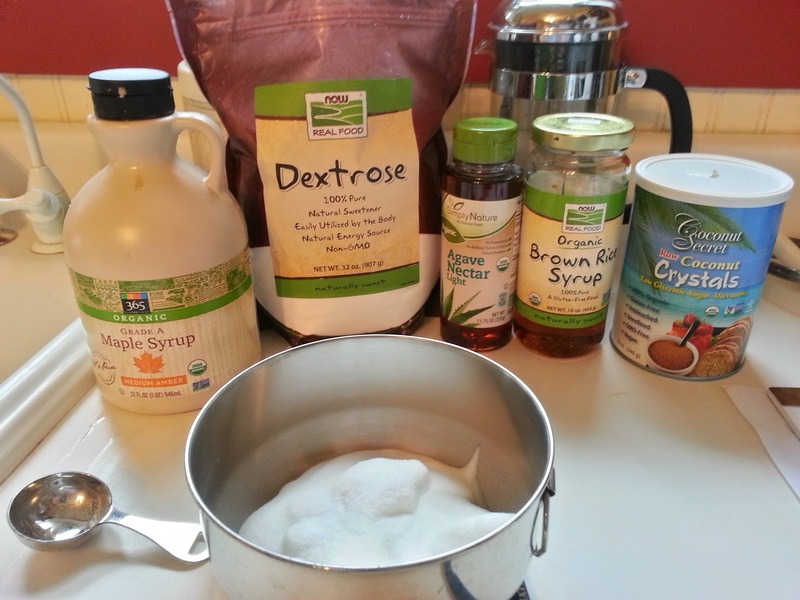 Way at the top of the glycemic scale, and a powder, I was curious how it would work, even though it's way worse for you than cane sugar in terms of glycemic index. 1 Tbsp - Still very beany. Not sweet at all. The maple syrup was way sweeter, oddly. 2 Tbsp - a bit sweet now, but no discernible sweetener taste like the overpowering taste of maple syrup. 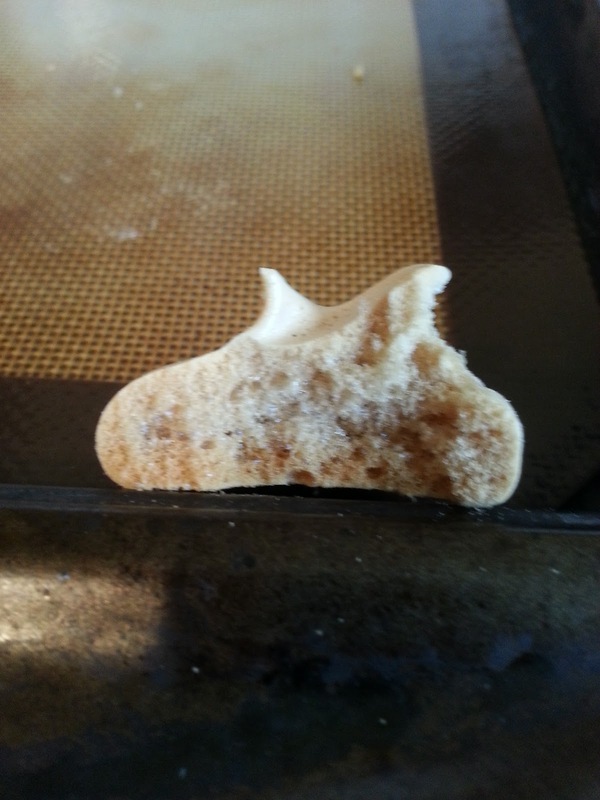 3 Tbsp - Very stiff peaks now. Would be good for a meringue. The bean taste is about what it would be with cane sugar. Still there. 4 Tbsp - Starting to taste like Smarties® now, or some other dextrose-based candy. Way too sweet. Put it in the freezer to test later as "D"
Coconut crystals are dark, moist crystals, a bit like dark brown sugar, and since they're not wet like syrup, it made a fluff that was able to hold stiff peaks. 35 on the glycemic index, it's ostensibly better for you, but not as accessible as, say, maple syrup. I got mine here. 1 Tbsp - instanly dark fluff. The taste is unique... like a thrice baked meringue. 2 Tbsp - Stiff peaks, sweeter, but still not too sweet. Very good, actually. 3 Tbsp - Shiny now, stiff peaks still, much darker. Taste is bordering on too sweet. Making a meringue out of it and putting the rest in the freezer to test for icecreamery as "G"
After baking the meringue at 200°F/93°C, it was light and delicious, and very airy throughout. No hollowness or chewiness. At 3 tablespoons of sugar to 40mL of aquafaba, we're talking about a tablespoon shy of one cup of coconut crystals to 1 "can" of aquafaba. One cup or more might be even better. It's a great meringue in its own right. Super yummy. It tastes very similar to my thrice baked meringue invention where you take a baked meringue, pulverize it, add water and remake it, thrice over. It's got dark, rich notes in it; it's just missing the smokeyness that you get from re-baking. This was by far the most interesting one. It's got a low glycemic index, coming in at only 25, and it doesn't have an overpowering taste like the previous three sweeteners do. 1 Tbsp - Still beany, but already sweet. It's a little darker, too. Still some peak left, but not enough to make great meringues. Ok as a fluff. 2 Tbsp - Sweeter, less beany already. No identifiable sweetener taste. 3 Tbsp - Runny, no chance at peaks at room temperature. Not sure about cold. It's starting to develop a very interesting, slightly creamy taste. 4 Tbsp - Definitely runny now, but the taste is much more like fluff. It's almost "creamy" like with Italian meringue. Still not too sweet, though, trying an extra Tbsp. 5 Tbsp - A bit too syrupy, But good. That extra creaminess is something interesting. There's definitely an interesting sweet spot [npi] around 4Tbsp where it starts to develop a similar taste to when you boil sugar and add it to the aquafaba. Added it to the freezer as "E" to see how it will turn out when cold. It's too runny to stand on its own as a fluff or to make meringues at that point, but the taste is closer than any of the previous ones, so it seems like you could at least substitute some of the sugar in a vegan meringue with brown rice syrup to make a raw fluff that tasted more like the real thing if you didn't want to bother heating your sugar. Amazon has a bunch of brown rice brands. 1 Tbsp - Tastes like burnt sugar. Too sweet already. Bleach. That's about it on agave. Not a fan. Didn't freeze it. 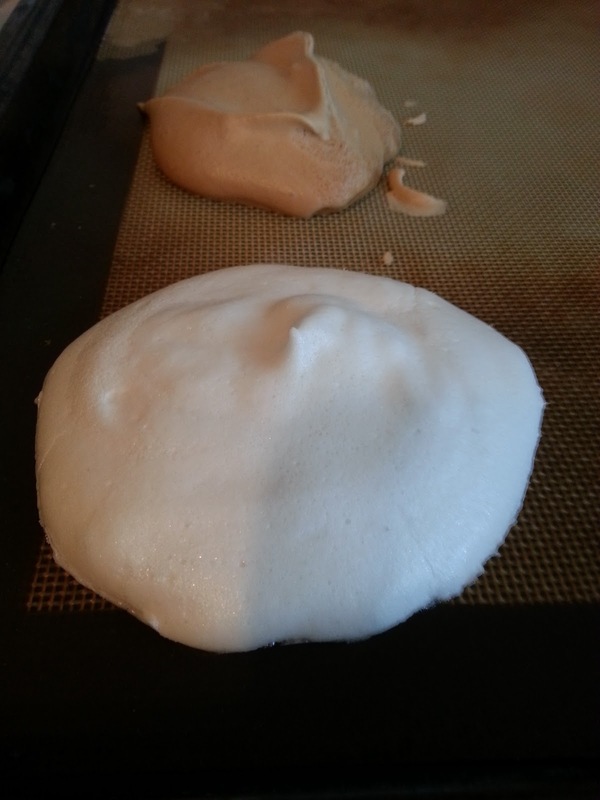 Overall, it seems like there are definitely options for reducing the glycemic index of a meringue or fluff made from aquafaba, but to get that real "Fluff" taste, you really do have to resort to heating and/or vanilla. There are so many recipes on the Vegan Meringues Hits and Misses! for Italian or "Internationale" fluffs, you can go there to explore. The one that tasted the best to me was the first one I posted to that group, but it used a combination of xanthan gum and versawhip. I've made several marshmallow recipes since then and a couple of different cane sugar based fluffs since then, but none of them come close to that recipe in terms of taste. I hate versawhip with a passion though, so it seems like the best choice for something approaching the standard commercial marshmallow cremes would be boiled sugar with brown rice syrup, added to aquafaba with vanilla and xanthan gum. But then you've essentially recreated Ricemallow made with aquafaba. Hey Suzzanne, want to license some aquafabulous technology? lol. Were you referring to chick pea (gram, besan) flour as aquafaba flour?